Permanent Deputy Prime Minister Nguyen Sinh Hung emphasised the Government’s investment in children is a guarantee of the nation’s future. As a result, the mortality rates among newborns and under-fives were halved in the past two decades and expanded, large-scale immunisation campaigns have led to the elimination of polio in 2000 and tetanus among pregnant mothers and newborns in 2005. Up to 95% of school-aged children can afford schooling while child abuse has been steadily reduced. Challenges, however, remain on the road towards creating a beautiful world for Vietnamese children where all their rights are exercised and protected, Hung admitted. 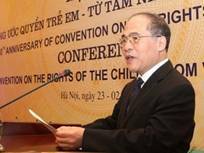 He cited as major challenges to the rights of the child: Vietnam’s advancement towards becoming a middle-income country, the global financial crisis, climate change and the increasing disparity in terms of gender equality among different parts of the country. Minister of Labour, War Invalids and Social Affairs Nguyen Thi Kim Ngan called for concerted efforts to protect children’s right to live and flourish in a high-quality environment. She also called for steps to be taken to ensure children’s rights are protected and that they live in safety as well as to facilitate their inclusion in social affairs in an effort to make social welfare and services accessible to all. It is of primary importance that all opportunities should be fully tapped for children to grow up well and live in a happy environment, Ngan concluded.